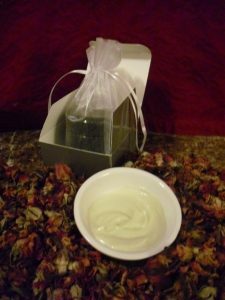 All Natural, Wrinkle-Reducing, Moisturizing Face Cream made with wild herbs and organic herbs that tone, nourish and moisturize the skin, disguising age & reducing wrinkles. All natural and organic ingredients. This moisturizing cream turns dry skin into beautiful, healthy skin at first contact with your skin. Made with natural, anti-oxidant-rich, cold-pressed Olive Oil – the herbs in this magical cream offer a vitamin and mineral topical application for your skin. Rich & Luxurious. Moisturizes, Tones, Nourishes and Eases Wrinkles Away, leaving your Face Glowing like a Maiden. Unique recipe – developed by Mystical Rose Herbals and available only from Mystical Rose Herbals. Hand-Whipped, made with Organic & Wild-Harvested Berkshire Herbs. The original recipe for this Luxurious Face Cream is said to have been used by Cleopatra herself. Ingredients: A Proprietary Combination of Carefully-Harvested (non-Certified Organic) Herbs that are Sun-infused in Organic Olive Oil & Organic Grapeseed Oil then whipped with Distilled Water, Locally-gathered Beeswax, Organic Palm Fruit, Lanolin, Natural Vitamin E and a Borate Salt to aid in Emulsification & Preservation of the Cream.